TORONTO, ON--(Marketwired - April 17, 2014) - Today, Métis Nation of Ontario (MNO) President Gary Lipinski signed a renewed five-year Framework Agreement with the Honourable David Zimmer, Ontario Minister of Aboriginal Affairs, on behalf of the Ontario government. The agreement builds on a 2008 agreement, but includes an increased focus on Métis rights through "advancing reconciliation between the Crown and the Métis people" and providing "a framework for meeting Ontario's constitutional obligations towards the Métis people consistent with the honour the Crown and decisions of the courts." MNO President Lipinski said, "The renewal of our Framework Agreement is timely given today's Federal Court of Appeal decision in Daniels v. Canada which re-affirms that the federal government has constitutional jurisdiction and responsibility to deal with the Métis as a distinct Aboriginal people." "In Ontario, Métis rights and claims, as recognized by the Supreme Court of Canada in the landmark R v. Powley decision, remain unresolved because the federal government has been denying its responsibilities and not coming to the table to negotiate. We hope that today's decision is a wake up call. Canada's wilful blindness to Métis rights and claims cannot continue," added Lipinski. Notably, the Framework Agreement commits the MNO and Ontario to jointly "pursu[ing] discussions with the Government of Canada on Métis rights issues and the Crown's consultation duties." Ultimately, the MNO hopes a Federal Métis Claims Policy is developed, which would provide a process to address these outstanding rights and claims issues similar to what the federal government has developed for First Nations and Inuit peoples. "The message is clear from the courts: the federal government cannot continue its complete exclusion of Métis from specific and comprehensive claims processes that are open to the two other constitutionally recognized Aboriginal peoples. The jurisdictional football the Métis are subjected to with respect to their rights, claims and needs must end," stressed President Lipinski. The Framework Agreement also makes a new commitment on the part of the MNO and Ontario to "advance initiatives that support Métis children and youth to be the best that they can be." This enhanced youth-oriented commitment -- a priority for MNO President Lipinski's mandate -- reflects the MNO's ongoing commitment to building a stronger Métis Nation and Ontario. "Today's signing of a renewed Framework Agreement," stated Minister Zimmer, "will build on the 2008 agreement which helped develop important consultation capacity within the Métis Nation of Ontario, supported economic development initiatives and led to improved outcomes for Métis students. I am confident the renewed agreement will further advance the well-being of Métis people in Ontario." "Whether it's enhancing our MNO bursaries at 31 colleges and universities across the province or making strategic investments to support Métis kids to see opportunities rather than obstacles, the processes and commitments set out in this Framework Agreement will assist us in building a stronger Métis Nation and Ontario," concluded President Lipinski. 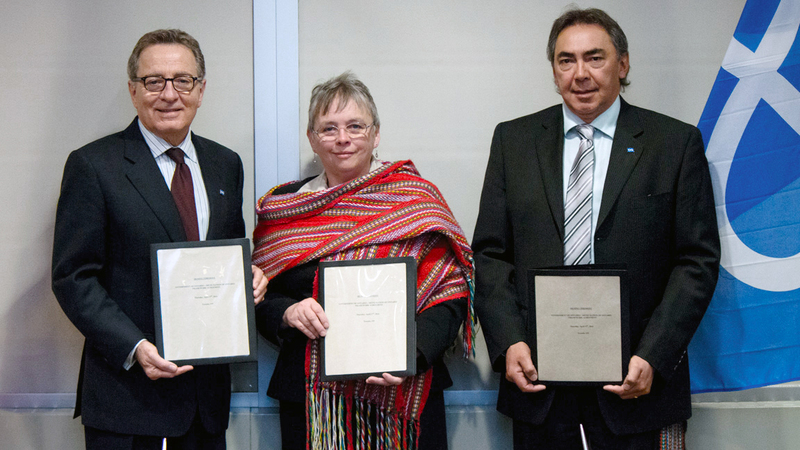 (Left to right) The Honourable David Zimmer, Minister of Aboriginal Affairs; MNO Chair France Picotte; MNO President Gary Lipinski at the MNO-Ontario Framework Agreement signing April 17, 2014.